Premier Cuvee For Red Wines, White Wines, Champagnes and for restarting stuck fermentations - Makes 6 gallons of wine with a good alcohol tolerance. Ferments to dryness. Makes 5 gallons - 12% Alcohol Tolerance - For White Wines, some Red Wines, Fruit Juices and to restart stuck fermentations. Also used with Root Beer. Not commonly used for sparkling wines. For 5 gallons - All Purpose for full bodied Red & White Wines --- 8-10% Alcohol Tolerance. 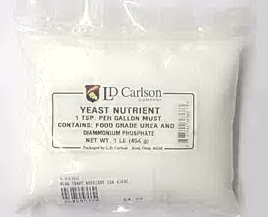 This yeast is used by many major wineries for making wines from fruits, berries, flowers, vegetables or grapes. Makes 5 gallons - Encourages development of varietal fruit flavors also Cabernet and for grapes picked early. A strong fermenter and helps bring out fruity flavor. 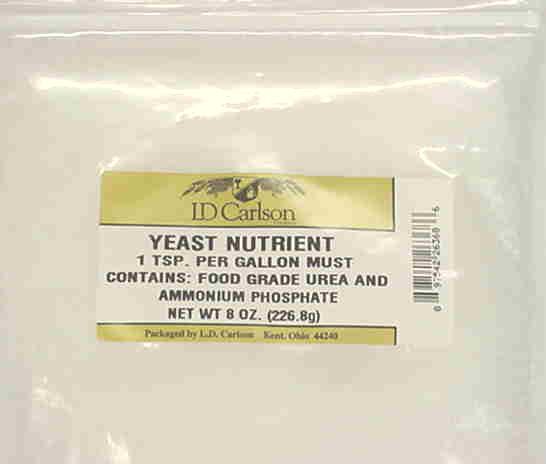 An active dry wine yeast used specifically for white wine. This packet contains enough yeast to make up to 6 gallons. This is an active dry yeast specifically used for Sherry. This envelope contains enough yeast to make up to 6 gallons. For sweetening finished wine. Add to wine after stabilizing and clearing. Use 2 teaspoons in 1/2 cup warm water. Sufficient for 5 gallons. 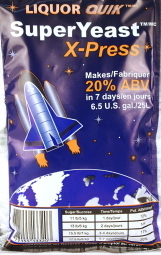 Use to help restart a stuck fermentation and to increase active yeast cell count. Use up to 1/2 teaspoon per gallon. Also known as tannic acid, this tannin is very light in color. It is preferred by most winemakers to be added to their white and rose wines. Tannins plays three distinctive roles in wine. The first is flavor. Tannins increase the zesty flavors that is often lacking in many home wines. Quite literally tannin is the "zest" or peel of the grape. Tannins aid in the clarification process. Residual proteins and other particles are neutralized by its presence. Tannins also aid in the aging and keeping qualities of the wine. Wines deficient in tannin tend to not take advantage of the aging process. Their improvement with time is only marginal. These wines also tend to deteriorate in quality more rapidly in longer storage situations. 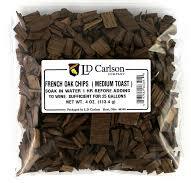 These french oak chips give a toasted wood flavor to wine. Requires no rinsing. Just wash in solution and your ready. 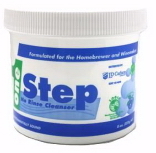 Perfect for cleaning glass bottles, jugs and carboys. Also safe for sanitizing aluminum, stainless steel, other metals and plastics. Sanitize your spoons, hoses, hydrometers and other equipment--even counter tops. Cleans with environmentally-safe oxygen. Contains no chlorine. bisulfite, organic compounds or phosphates. Use 1 tablespoon to each gallon of water. Comes with directions. This is the old fashion way to clear your wine. Enhances the clarification process when the fermentation is done by destroying suspended pectin particles that may linger. 4 lb. 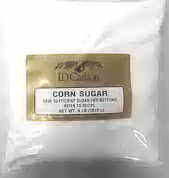 Corn sugar for wine making or sausage making. 2lbs Corn syrup solids for making wine or sausage. *Contains: Food Grade Urea and Ammonium Phosphate. 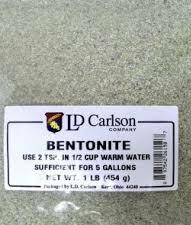 Contains: Food Grade Urea and Diammonium Phosphate. Prevents beer and wine from oxidizing. Also helps to maintain color. Wine Acid Blend 2 oz. Contains:Food grade Citric, Malic, and Tartaric Acid. A convenient way to accurately sulfite wine. Releases sulphur dioxide, which acts as a sterilant and antioxidant. Uses 1-2 tablets per one gallon to kill yeast. Actually is sodium bisulfite. Antioxidant and bactericide sanitizer that uses 2oz. to 1 gallon of water. 8 oz. pack. Contains sulfur dioxide for killing wild yeasts and bacteria. Can also be used before bottling to help stop lingering fermentations. Also used for the sterilizing of bottles, jugs, and equipment. Leaves no sediment in wine. Easy to use and simple to store! Sterilizes bottles to the T! This brush is to clean wine bottles or whatever else you want to use it to clean. It measures 2 ft long and about 14" around. This brush is to clean wine bottles or whatever else you want to use it to clean. It measures 28" long and about 6" around. Curved but can also be bent straight.